Animal Lovers take great pleasure in celebrating the birthdays of their family pet! Give your pet a real treat and make him one of our homemade dog birthday cakes. You know what foods that your pet enjoys so browse through our recipes to find just right ingredients for your dogs or puppies. We have also provided lots of facts and information about using healthy food to create your very own unique cake. Learn how to make dog birthday cakes by following the simple step-by step guides. You don't have to be a great chef - just follow the easy instructions to learn how to make dog birthday cakes. Check out the list of ingredients and then just follow the preparation method. Dogs birthday cakes would make a great homemade gift for any of the dog-lovers you know in your family or your friends. The preparation time for some of the free dog cakes recipes are just ten minutes - your friends and family will be thrilled you have taken the time and trouble to make one of the dogs birthday cakes. They will soon be asking you exactly how to make dog birthday cakes! The free dog birthday cakes recipes provide details of the ingredients - simple ingredients and easy cooking techniques. 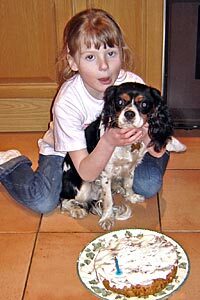 You can make a delicious treat for your pet dogs or puppy in no time - the preparation time for some of the free dog cakes recipes are only ten minutes. 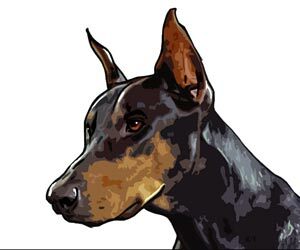 Many owners are naturally concerned about the health of their animals. We have some tips and guidelines for making some healthy dog birthday cake recipes. The great advantage of a homemade cake is that you know exactly what the ingredients are - ensuring a healthy birthday cake for your dogs or puppy. Follow one of the free dog birthday cakes recipes for any number of special occasions. The recipes can easily be used as Canine Christmas Cakes, Canine Thanksgiving cakes or even Canine Super Bowl cakes! Whatever the occasion treat your pet and make one of the quick and simple canine 'birthday' cakes! Lucy Pendlebury ( aged six ) helped her Dad, Keith, to make this birthday cake for the first birthday of their dog Louis in March 2006 - only the candle was left by Louis! Give your dogs a real treat and make him one of our homemade dog birthday cakes. Learn how to make dog birthday cakes by following the simple free dog birthday cakes recipes. These recipes can easily be used as Canine Christmas Cakes, Canine Thanksgiving cakes or even Canine Super Bowl cakes! You can make a delicious treat for your dog or puppy in no time - the preparation time for some of the free recipes are only ten minutes. Check our hints tips and facts about healthy food. Find out what foods should not be fed to your pets. Recipes which your dogs or puppies will drool over!